The most you could ask for cleaning the house. In vacuum mode you can vacuum both dry or wet. 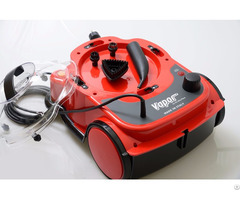 Thanks to its vast range, it can vacuum up to 8 l of water. Equipped with a safety float that stops liquid suction once the tank is full. 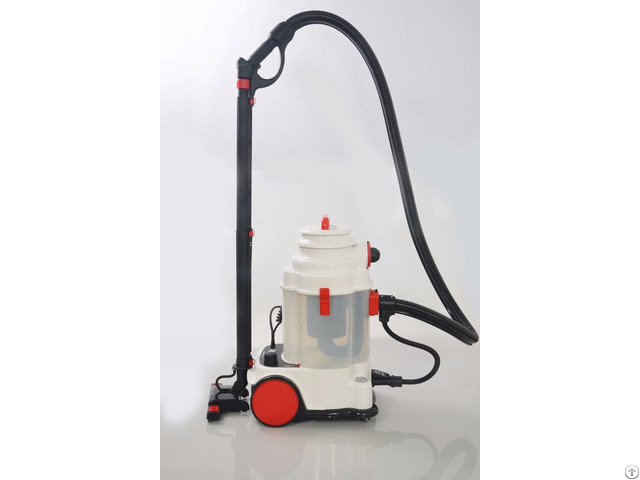 The tank can be removed from the appliance to enable easy cleaning. Ecological: the new water filter traps dirt, eliminates dust, dust mites and pollen without using a bag. The blower function allows you to easily blow up balloons, life jackets or inflatable boats; it is also useful to blow away dust from difficult to reach corners, such as radiators or hi-fi systems or blow away leaves. With a specific nebuliser accessory, which can be adjusted and orientated, you can spray delicate flowers. Adding just a few drops of essence to the water or a stick-deodorant in the blower plug, scents and creates a pleasant aroma in the entire surroundings. Sagittarius is also a powerful steam cleaner to sanitise and clean all your home. The degreasing power of the steam dissolves the dirt, eliminating any dust mites or bacteria responsible for allergies. 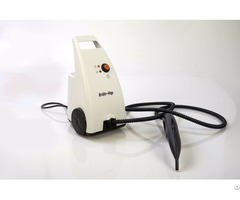 Its efficiency speeds up cleaning of hard floors, tiles, windows and carpets. Ideal against difficult dirt on ovens and cooker rings. Ecological: no detergents are required, respecting the environment and enabling real energy savings. Unlimited steam: constant and safe top-up of the water tank possible without having to stop or switch off the machine, guaranteeing considerable energy savings. Sagittarius can also provide in-depth degreasing with steam and simultaneously vacuums to gather dirt using the innovative water filtration system. The wide range of accessories allows you to clean everywhere, even difficult to reach spots. NEW!! Now, with a simple move, it transforms into a professional ironing machine: perfect synthesis between compactness and functionality. Use a professional type iron with a perspiration-proof cork handle and aluminum plate with a perforated tip. The “dual steam” function flattens even the most stubborn creases (find out more about our dual steam). 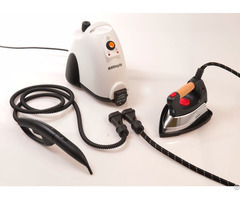 Equipped with a iron stand mat for the convenient re-positioning of the iron when in use. This system gives professional results thanks to the steam pressure that reaches 5 bar. The good boiler capacity guarantees vast working autonomy without stopping to top-up water.